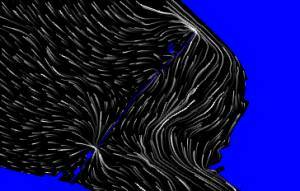 Alluvial rivers are very complex because of the interaction between a turbulent flow and a deformable bed. Conventional fixed bed hydraulics may not be good enough to describe such flow in rivers, as discussed below by means of some Peruvian examples. The data show that although the discharge in May doubled the value in January, the WSE was almost one meter lower! How can this be explained? The answer lies in general riverbed erosion, also known as degradation. As a consequence of degradation, riverbed elevations decrease (see picture below) which translates into lower WSE. Riverbed erosion is a time-dependent problem. 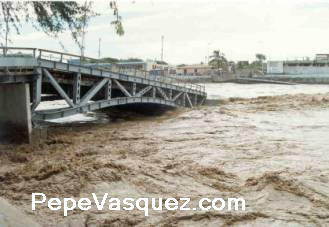 Erosion is not instantaneous; it requires time to develop as shown in the stage-discharge relationships for the Piura River in 1983 (at Sanchez Cerro Bridge).Notice for instance that for 1000 m3/s in January the WSE was around elevation 29 m, while in May it has dropped to elevation 25.5 m, more than 3 meters! The first conclusion is that Piura River does not exhibit a unique stage-discharge relationship, instead an envelop of possible values that is variable with time depending on the history of previous discharges. 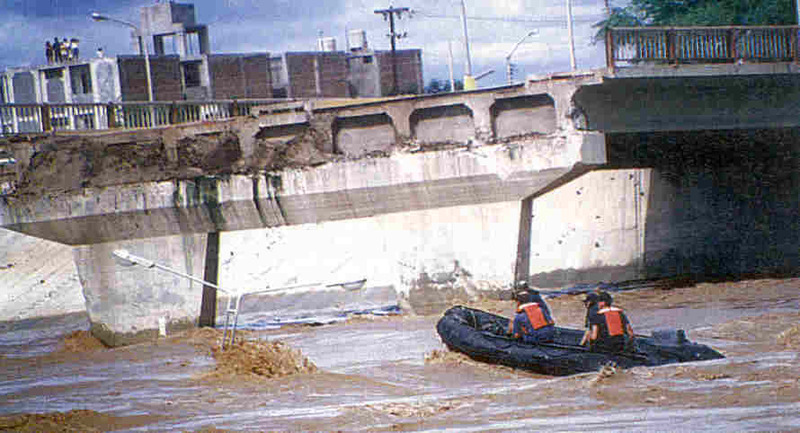 Although riverbed erosion has the beneficial effect of decreasing WSE, thus saving Piura city from being flooded, it had a very tragic effect on the bridges. 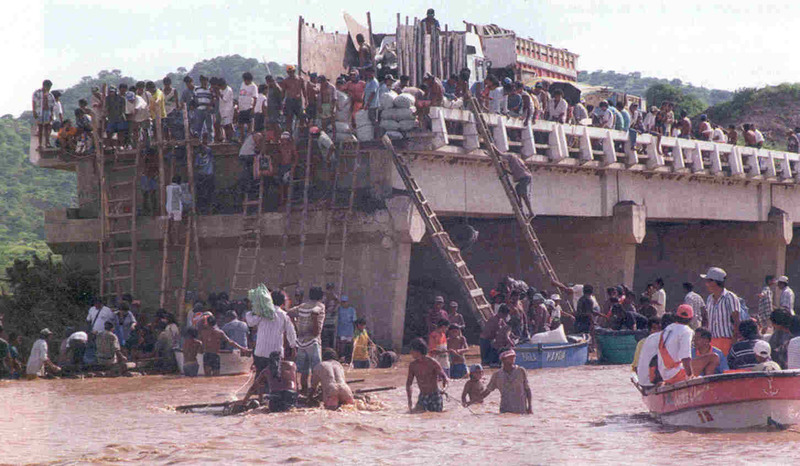 In 1998, El Niño struck again in Piura. 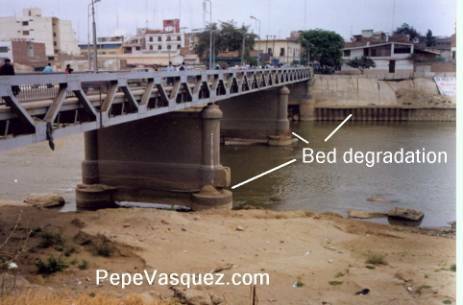 This time bed degradation was even higher (probably because of dykes built downstream after 1983), destroying two of the four bridges of Piura City, killing dozens of people who were crossing the bridges. 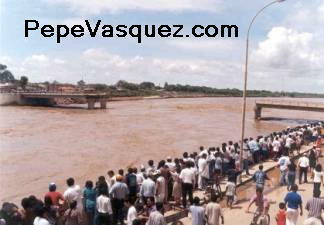 The tragic toll of riverbed erosion in Piura: (a) El Viejo Bridge failed killing one driver who felt with his car. (b) Bolognesi Bridge lost its central pier and two adjacent decks fell carrying dozens of people into death. Another notable aspect of Piura River is the WSE slope does not remains constant, but increases with discharge. In uniform flow in open channels, WSE slope is parallel to bed slope, and that is also a common assumption in rivers. Piura River has an average bed slope of 0.3 m/km (0.0003); however, WSE slope for high flows can be high as 4 four times that value! The reason is the increased energy loss in the constricted reach (energy loss is proportional to the square of the velocity). As discussed before, the flow in Piura River is too complex to be successfully simulated using conventional fixed bed hydraulics. Even the popular 1D hydraulic model HEC-RAS was unable to reproduced observed WSE, because of its inability to account for bed level changes. A 1:50 physical model (80 m long), as well as numerical models, were needed to study WSE and scour levels in this reach of the river. The figure at the right shows the velocity field computed by RMA2, a 2D Finite Element model. Below are the results of the WSE and bed profiles for the peak discharge of the hydrograph recorded in 1998. The channel constriction is roughly between station 3000 and 5500 ("Tramo B" in the picture). The blue line is the WSE, the black line the initial bed elevation, the red line the bed level computed by BRISTARS, and the green line the bed level recorded in the physical model.BRISTARS was able to reasonably well reproduced observed WSE, velocities and scour levels. The Tumbes River is also located in Northern Peru. It is a meandering sandy river, spanning a flood plain of more than 3 km wide in the section where it crosses the Pan-American Highway, through four bridges. On the right bank, Tumbes City is located in the outer bend of a meander, where bend scour is intense. 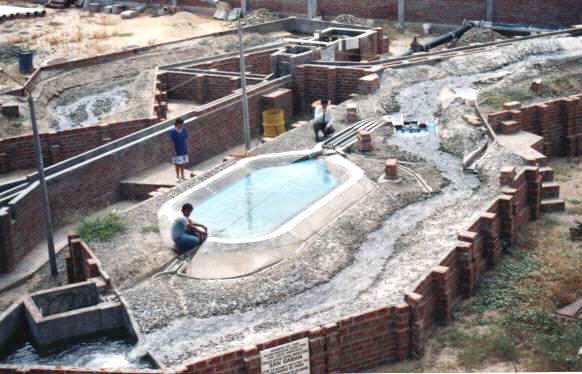 During 1998 floods, part of the concrete bank protection of Tumbes was undermined by scour and partially failed, putting the city at great risk of beeing flooded. The Digital Elevation Model (DEM) is shown on the right picture. The light green color represents the main channel, and the blue color the floodplains. The flow pattern is highly bidimensional, with some flow moving towards the main bridge on the right bank, and the rest of the flow crossing the Highway through the other 3 bridges. The 2D numerical Finite Element model FESWMS was applied to simulate the flow. 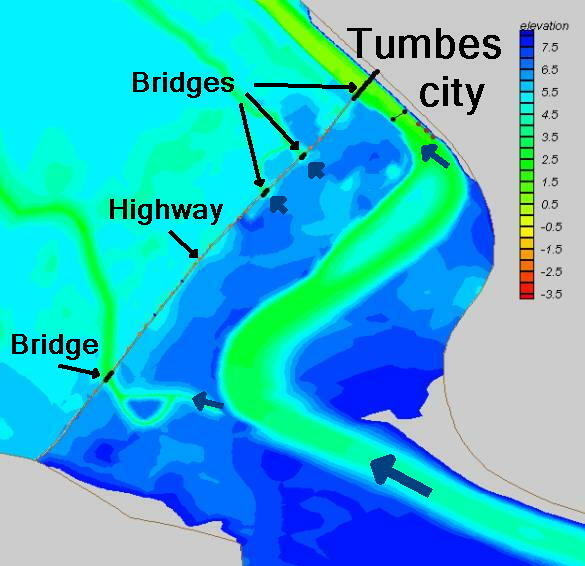 FESWMS computed the velocities and flow distribution through the four bridges for a discharge of 3800 m3/s. The maximum velocity found, around 4 m/s, was found on the area were the concrete revetment had failed (see a video of flow lines). It was found that 75% of the flow crossed the highway through the main bridge on the right bank (Tumbes Bridge). FESWMS was also applied to analyize the influence of increasing bridge capacity on WSE and flow velocities. Click over the pictures to see an enlarged version.